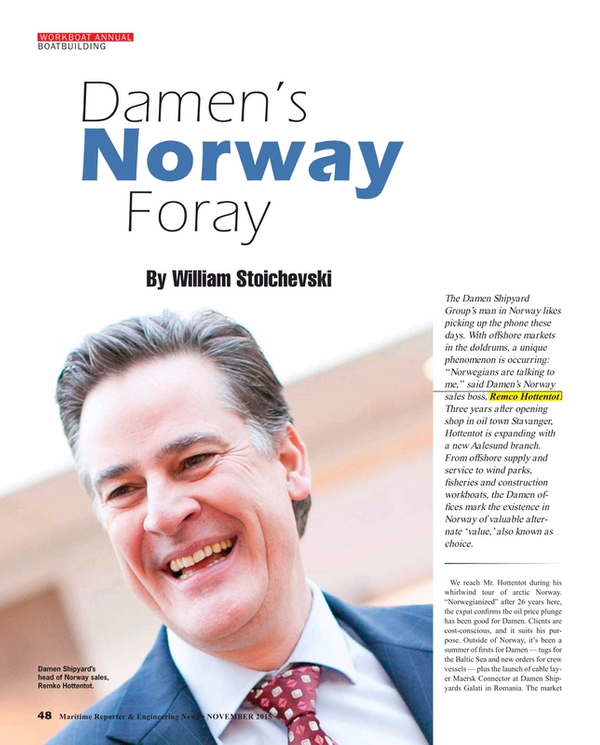 The Damen Shipyard Group’s man in Norway likes picking up the phone these days. With offshore markets in the doldrums, a unique phenomenon is occurring: “Norwegians are talking to me,” said Damen’s Norway sales boss, Remco Hottentot. Three years after opening shop in oil town Stavanger, Hottentot is expanding with a new Aalesund branch. From offshore supply and service to wind parks, fisheries and construction workboats, the Damen offices mark the existence in Norway of valuable alternate ‘value,’ also known as choice. We reach Mr. Hottentot during his whirlwind tour of arctic Norway. “Norwegianized” after 26 years here, the expat confirms the oil price plunge has been good for Damen. Clients are cost-conscious, and it suits his purpose. Outside of Norway, it’s been a summer of firsts for Damen — tugs for the Baltic Sea and new orders for crew vessels — plus the launch of cable layer Maersk Connector at Damen Shipyards Galati in Romania. The market is North Sea wind park grids and infield power. Q. Is cable-laying the North Sea business that has taken off the most? A. The first (cable-layers) are going to work in the Netherlands, but Germany, Denmark and others are gearing up to service offshore windfarms. But, our clients operate worldwide. They’ve bought them for the long-term and not for just one project. The cable-layers — the one for Van Ord (Nexus) and for Maersk — are the Damen Offshore Carrier. Have you noticed that vessel? We basically use a smaller version for the windfarm cable-layers. The larger one — the 8.5-ton-one — has brought interest from (new) types of clients. It’s outfitted as an offshore cable-layer, but it can be outfitted as an offshore installation vessel or support vessel or a transport vessel. It continues to be a self-propelled platform that you can put more equipment on. Take, for example, the carousels where the cables are laid. Q. You recently opened an office in Norway, a tough market for outside sales. Why was the timing right for a Damen office here? Which Damen offerings ought to be attractive? A. For Norway at the moment there’s … offshore. But the business we see most is the vessels for aquaculture. We’ve seen growth now in all sorts of workboats. These vessels are so chewed out in their concepts that they’re ideal for this industry, so we’ve sold a few. They’re useful to the sjøentrepreneur — the guys who build quays and bridges. Most are standard vessels that we have in stock. We also have dedicated vessels for the aquaculture industry because we expect the industry will double in the next five years and grow fivefold by 2050. The industry is also expected to move further offshore, and you need different kinds of vessels for that. Q. Among 22 tugs and pontoons shipped recently from Damen shipyards in Asia for sales in Europe there were two Fast Crew Supplier 2610’s for wind park service. How do you see the future market needs of offshore wind, and can these vessels be used for other renewables projects? A. We have delivered a lot of (FCS) vessels to the Middle East. It isn’t a large focus in Norway. You mention offshore wind. With FCSs, we expect to keep going into offshore wind with the FCS 3307 and its small sister the FCS 2008. Why? Because regulations are changing for vessels up to and over 20 meters. We expect the small boats to be replaced, (and) that’s why we have the 30m ‘07’. The FCS models are selling, and we haven’t stopped developing the concept. FCSs are suitable for tidal farms or wave energy installations, and for offshore! More and more, the FCS 2610 is seen as a high-speed, crew-friendly support vessel. We see it used for crew supply in the fjords and from Stavanger, where Heerema has a big crane vessel. They’re using it as inexpensive people transport. Q. There’s a bottleneck of wind projects in Norway. Would you be ready to offer grid builders a range of vessels should the project count suddenly increase? A. Well, we have the walk-to-work vessel. If you want go out to the 25 nautical mile range, then you want to stay out there because you don’t have boats going in and out by the day. You need larger vessels. We’re very aware of those tenders (for larger vessels) and the projects going on. We’re very involved with customers on a new W2W design. With wind farms it’s no longer just shallow water. Statoil’s HyWind project is in deeper water. The turbines float. That opens another market for Heavy Lift T&I vessels like those we built for Jumbo Offshore. Q. What obstacles, if any, has your sales organization met entering the Norwegian market? A. It was three years ago, and I started there alone in Stavanger, and now we have expanded to four people. It fact we’re growing motstrøm: We’re going against the current here. As people are being laid off we’re adding those lost by others. They are people dedicated to sales of news boats and to repair. When I started here, it was high times offshore, and we had a lot of focus on oil and gas. To break into that market is very difficult. There are a lot of old, existing relationships. Q. What are your goals this year? Next? How hard is it going to be? Q. Norway offers countless harbors, jetties, a large refinery, smaller ones and an LNG export terminal. Mining looks set to expand. What Damen offering best addresses this market? A. We put about 50 ships in stock every year, and that is very attractive to the guys in aquaculture, port operations and construction. It’s vessels that have grown out of the dredging industry in The Netherlands into sophisticated workboats. These are shipped cold-stacked. As for where we want to grow. Our focus, obviously, is offshore support with, likely, the simpler vessels that’ll locate based on low OPEX. Q. What will you do when this interview is over? A. I’m on the road visiting clients. The first thing is to make a list and prioritize, and it’s all workboats at the moment. We’re taking the main challenges of each industry very seriously, and you can’t design a ship without operational input. There’s a lot of design, but we take that to our customers, and they can still fill in and decide all the bits and pieces on the deck, like where the cranes and winches have to be. The design is done, and that means we can deliver fast. I can say, “I have a vessel for you. It might not be 100 percent compliant, but it’ll be 99 percent.” It means you can start making money from Day 1.